Here are some of the tools that I reach out to regularly when I'm making my arrangements. There are some other items such as floral foam and pin frogs but I haven't used yet since I've been making a lot of hand tied bouquets lately. I've also heard that floral foam isn't biodegradable. I've also been thinking a lot lately about the carbon footprint the floral industry leaves on this earth, as flowers are being imported and exported all over the world. As the weather warms up, I really want to explore more local sources for flowers - but that's for another future post. 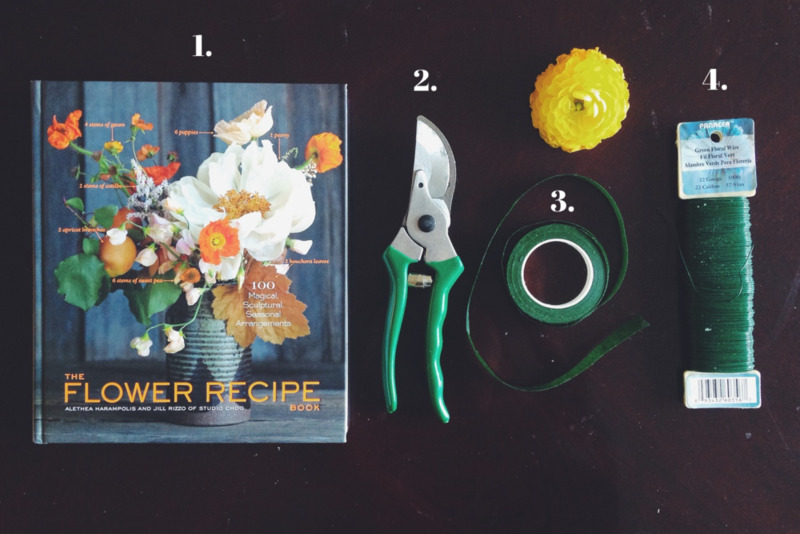 Aside from all the blogs and instagrams of florists I follow, "The Flower Recipe Book" has been one of the best instructional sources that I've been learning from. The book has a description and breakdown of flowers A-Z from Astilbe to Zinnias. Including suggestions on arrangements and helpful tips on the flowers' personal care and quirks. And every single page is just drop dead gorgeous, truly every arrangement in this book is a work of art. Floral tape. The adhesiveness of the tape gets activated when you stretch it, which is why it is the perfect way to wrap your hand tied bouquets. Then you can cover it up with some pretty ribbon. I bought this in bulk at Michaels for a few dollars. Floral wire. I haven't really used much of this. Just when I've been wiring together branches for a Christmas wreath I made this past winter. But I've also used it to feed through droopy hollow stems to keep the flower upright. I just cut a piece of wire, fed it through the bottom of the flower until it gently hit the head of the bloom. You can also use floral wire to make artificial stems for your succulents, if you want to include the in your arrangements - as demonstrated in this video. I also bought a pack of these from Michaels. If you're interested in "The Flower Recipe Book" I ordered it off Amazon, just click the picture to link to the order page! Hope this helps to give you a bit of an idea on what you should stock up on if you want to start making your own arrangements!